Not even 3D can elevate the dull proceedings of the last Harry Potter movie, filled as it is with prolonged dialogues and tepid action. There is not a single memorable moment of cinematic magic - the dark, grey environs only adds to the story's too stretched elasticity. On summing up, the movie series lost its mojo somewhere in the fourth part and never found it again. The main characters die without any noticeable effect on the audience, neither does Voldermort's presence evoke any sense of danger. 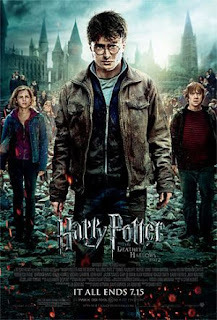 Harry Potter did start as an engaging story for children, and, we can say - never grew up well. Strictly for die-hard Potter fans.